"Ooh, what a lovely street"
Google Street View is launching its own Street View awards, celebrating all that is good with the UK's streets. The general public and a panel of judges will decide Britain's best foodie street, best fashion street, and most picturesque street. In all, 50 streets in 25 different cities have been shortlisted, and the public can use Google Street View to decide on their favourites and vote. Among those judging is VisitBritain, whose job, coincidentally is to promote British tourism. Agency spokesperson Sandie Dawe said: "We're really pleased to be involved in this exciting project, which will honour streets across Britain." Among the Most Picturesque Streets are Bath's Royal Crescent and the Shambles in York, along with Main Street, Tobermory, on the Isle of Mull, all of them very popular tourist destinations. Those of a foodie disposition can vote for the like of London's Charlotte Street, The Calls in Leeds, or Wilmslow Road in Manchester's Curry Mile. People more interested in looking good have a choice of 20 locations, ranging from Bridlesmith Gate in Nottingham to Buchanan Street in Glasgow, as well as two places in London – King's Road and Westbourne Grove. Judges in the three sections include TV hiker Julia Bradbury, former Fall singer, now fashion guru Brix Smart-Smith, and food expert Henrietta Green. 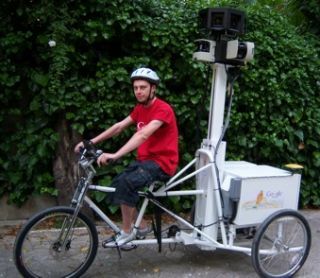 The awards should help improve Street View's image after plenty of controversy last year over allegations that its pictures invaded privacy.